PHMSA submits damage prevention study to Congress. On October 9, the Pipeline and Hazardous Materials Safety Administration (PHMSA) submitted to Congress A Study on the Impact of Excavation Damage on Pipeline Safety. PHMSA submitted the study pursuant to Section 3 of the Pipeline Safety, Regulatory Certainty, and Job Creation Act of 2011, which also required an examination of the effect of eliminating from state one-call laws all exemptions for mechanized equipment excavation. The study analyzes the frequency and severity of different types of excavation damage incidents; examines state-specific one-call notification systems and the relationship between one-call exemptions and damage incidents; and analyzes the potential safety benefits and adverse consequences of eliminating all mechanized excavation exemptions. PHMSA stated that the study was hampered by insufficient, inconsistent, and incomplete data that limited insights into whether operators were notified of excavation before damage occurred, whether entities causing damage were exempt from one-call requirements, or whether exemptions contributed to the incidents. PHMSA stated that reports by other entities like the Common Ground Alliance (CGA) and the U.S. Infrastructure Corporation, suggest that, generally, higher damage rates exist in states with more exemptions from one-call requirements. PHMSA supports applying state one-call laws to all excavators, with no exemptions. Updates on status of PHMSA Rulemakings. The table below reflects information on the status of PHMSA rulemakings as reported in DOT’s October Significant Rulemaking Report. Additional information from the OMB’s Office of Information and Regulatory Affairs (OIRA) is here. Note that OIRA has not updated this information in several months. Office of Federal Register issues final rule addressing incorporation by reference. On November 7, the Office of the Federal Register issued a Final Rule revising its regulations regarding the incorporation by reference of outside materials into federal regulations. The Rule requires that agencies seeking to incorporate outside materials describe in preambles of proposed and final rules the steps taken to ensure the materials are reasonably available to interested parties and summarize the contents of the materials. The Rule becomes effective January 6, 2015. Common Ground Alliance releases 2013 DIRT Report. On September 30, the CGA released its 2013 Damage Information Reporting Tool (DIRT) Report, which analyzes data from industry stakeholders regarding facility events that led to downtime, damages, or near misses. The report highlights a 3.5% decrease in damage incidents and an increase in locate requests, suggesting a correlation between increased participation in one-call programs and a decrease in damage incidents. The report also observed that: (1) the most common damage root cause in 2013 was insufficient excavation practices; (2) submitting locate requests is the most effective means of preventing excavation damage; (3) use of backhoes and trackhoes during sewer and water line excavation caused the highest number of damage incidents; and (4) natural gas and telecommunications industries experienced the most damage-related service interruptions. Pipeline Safety Trust releases local government guide to pipelines. The Pipeline Safety Trust has released a Local Government Guide to Pipelines (Guide) to provide local governments with basic information about the nation’s pipelines. The Guide provides an overview of how pipelines are regulated and operated, discusses the role of local governments in planning for community and pipeline development, and addresses emergency response and spill prevention. The Guide also includes recommended practices for local governments, developed by the Pipelines and Informed Planning Alliance, and a sample checklist for local governments when planning land use and development activities near pipelines. API Recommended Practice for Safety Management Systems available for review and comment. The American Petroleum Institute (API) announced that the second ballot of Recommended Practice 1173, Pipeline Safety Management System Requirements, is available for review and comment. The draft Recommended Practice provides guidance to pipeline operators for developing and maintaining pipeline safety management systems. Final approval will result in publication of the first edition of the Recommended Practice. The instructions for submitting comments are available here, and any comments must be submitted by December 20, 2014. 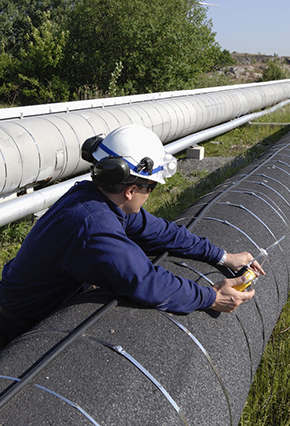 Pipeline Association for Public Awareness releases 2014 Pipeline Emergency Response Guidelines. The Pipeline Association for Public Awareness has released the 2014 edition of its Pipeline Emergency Response Guidelines. The guidelines provide an overview of types of pipelines and the different products they carry, and describe four incident response steps in the case of a pipeline emergency. The guidelines also highlight the importance of damage prevention and pipeline integrity management. *The Illinois Commerce Commission has proposed to amend its gas pipeline safety regulations to (1) incorporate by reference the federal pipeline safety rules in effect on October 1, 2014, and (2) require the electronic submission of plans, procedures, and programs that are submitted to the agency. Comments on the proposed amendments are due December 22, 2014. The Kansas Corporation Commission held a hearing on November 4, on proposed amended regulations adopting the 2013 version of the federal gas safety standards set forth in 49 C.F.R. Part 192. In addition, the proposed amendments would remove the 5-day repair requirement for class 1 leaks; permit utility companies to supervise repairs of natural gas lines in residential areas by defining “yard line” to end at the outside wall of an individually metered residential premise; and simplify the fee collection schedule for safety inspections and supervision by removing outdated assessment information. S 2422 (Greenstein & Bateman): This bill would require natural gas pipeline utilities to repair or replace leaking natural gas pipelines within time frames to be established by the Dept. of Environmental Protection (“DEP”). DEP, in consultation with the Board of Public Utilities, would adopt implementing regulations to prioritize time frames for the repair and replacement of pipelines based on the severity of leaks, best practices and repair standards, and de minimis exceptions to the repair and replacement requirements. The penalties for noncompliance would be those set forth in the Air Pollution Control Act (1954). The bill was introduced on September 18 and referred to the Senate Economic Growth Committee. SR No. 91 (Codey, Thompson & Greenstein): This Senate Resolution urges natural gas pipeline operators to adopt infrastructure, technology and management tools to prevent methane leaks in order to reduce greenhouse gas emissions, improve the efficient transmission and distribution of natural gas, and reduce the risk of methane gas-related emergencies. New Mexico Public Regulation Commission initiates rulemaking on excavation and One-Call Requirements. On July 9, the New Mexico Public Regulation Commission proposed to amend its rules for excavation damage prevention and One-Call programs. The proposed amendments would require the establishment of a “positive response registry system,” and update underground facility operators’ (UFO) response requirements to excavation locate requests to include a “positive response” even if the UFO determines it has no facilities within the proposed excavation limits. The proposed amendments also would make failure to provide positive responses, pre-mark the intended site, or report damage a “willful” violation. A public hearing was held on September 24. *SB No. 378 (Coley): The bill would, among other things, (1) provide the Ohio Public Utilities Commission (PUC) with authority to enforce the state’s one-call utility protection requirements; (2) set forth complaint and enforcement procedures for alleged non-compliance with one-call requirements; and (3) create an Underground Technical Committee to coordinate with the PUC in administering one-call requirements, receive and review PUC reports on complaints of alleged non-compliance, and recommend remedial action. SB 1503: This bill would replace the Pennsylvania Public Utility Commission with the Department of Transportation of the Commonwealth. The bill would require the Department to apply for federal delegation to enforce federal hazardous liquids and gas pipeline safety standards in the Commonwealth, and for authority to adopt interstate hazardous liquids and gas pipeline rules. The bill would also require the Department to seek federal delegation to act as an interstate agent inspection authority. The bill was referred to the Consumer Protection and Professional Licensure Committee on October 14.